Brighton beachfront is packed with terraces for al fresco wine-drinking, and the atmosphere can be magical in summer. But it gets seriously crowded, so here are seven secret summer terraces locals love to escape to. 1. Busby and Wilds. Tucked away at the end of a pretty side street in Kemptown close to all those delightful Regency seafront estates is this charming neighbourhood gastro pub open for lunch and dinner every day. The food is divine but it’s also home to an intimate al fresco paradise most people don’t know about. Walk inside the main pub, stay to the right and head through a door, along a walkway, through another door until you emerge into a beautiful summer terrace filled with tables and benches under a cherry tree. It’s the perfect spot for sipping cool rose wine and enjoying a delicious lunch or dinner. 2. The Coach House. 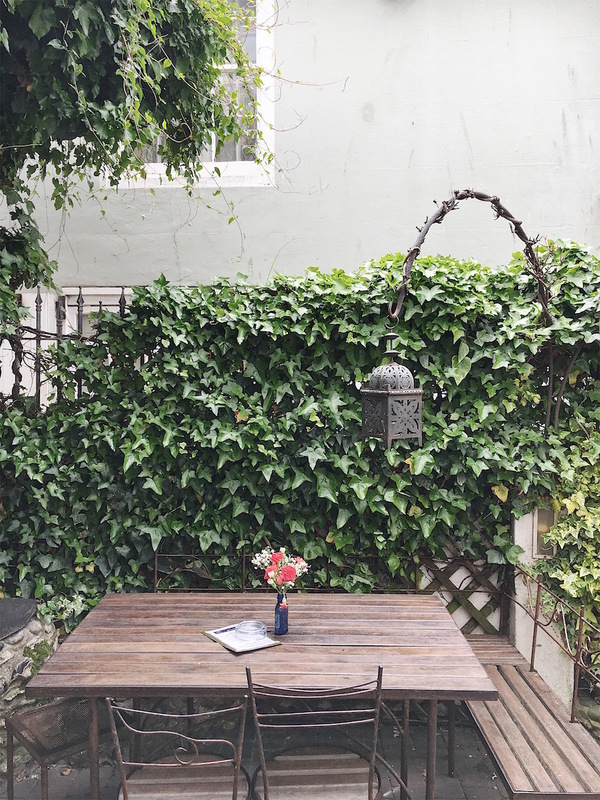 This local favourite pub’s plant-filled terrace makes the perfect al fresco stop off while shopping and wandering around the Lanes. It’s also great for a lovely lunch, an early evening wine and some dinner – or even the place for a magical wedding reception! Insider tip: They have happy hour from Sunday to Friday 5pm to 7pm. 3. You Juice. Hidden at the back of a cool little juice bar and health food cafe on the fringes of the North Laine is this miniature colourful yard-terrace. On the menu are tasty salads, soups and zingy juices, all of them pretty expensive, so you may as well stick around and get your money’s worth out of the garden for as long as possible. Wander through the maze of rooms in this gigantic 200-year-old pub upstairs and you’ll discover this hidden gem – a pretty two-storey roof garden terrace which is often surprisingly empty on weekdays. It’s a real treat of an escape away from the craziness of the seafront only a couple of minutes away. Seconds from the traffic and tourist chaos around Brighton station is this breezy Mediterranean sun-trap terrace. I discovered it one day I missed my train and had time to kill until the next one. Order a glass of wine at the bar downstairs, head upstairs and you’ll discover the little garden and instantly feel the stress melt off. 6. Cafe Rust. Slightly off the beaten path in Preston Park, this local favourite with its quirky-rustic Provence-style interior, might be one of Brighton’s most beautiful cafes. It serves amaaaazing food for breakfast, brunch and lunch, and turns into a beautiful candle-lit restaurant, called Chard, by night. But, what most people tend to overlook is it’s pretty little sun-trap secret garden out the back, perfect for escaping the seafront summer sun worshippers. 7. The Setting Sun. Perched on a hill between Hanover and Kemptown is this ordinary neighbourhood pub with epic views across the city down to the sea from its little roof terrace. Plenty of locals have heard of it, but seeing as I only found out about it a year ago despite living her 15 years I figure there must be others like me who don’t know about it, so I wanted to share. Insider tip: It’s obviously the perfect place for a sundowner, so get here early to nab a table. This might be the city’s cosiest pub. Set over three floors, it’s filled with all kinds of hidden nooks and corners – including two amazing terraces complete with outside fire for summer or winter drinks. Some lovely little places for me to explore on my next day out in Brighton, thank you for sharing.